As a novice LibGuides user I was very keen to attend the ANLTC training on LibGuides. The training course had been organised for both regular users and prospective users in mind. For anyone who is unfamiliar with LibGuides, it is a content management system which enables libraries to develop, reuse and share their content and library resources via an easy-to-use interface. More information is available here at the Springshare site. Some academic libraries in Ireland have been using LibGuides for a number of years while others are just embarking on the journey. The morning session featured a number of case studies from individual libraries about their experiences implementing LibGuides and their future plans. possible uses and future directions. Accordingly there was an interesting mix of experiences presented by the speakers. Different processes were used to develop LibGuides within the institutions. For example, UL employed a co-op student to get the project up and running, while in Maynooth University, one staff member (Celine), was instrumental in developing the project. 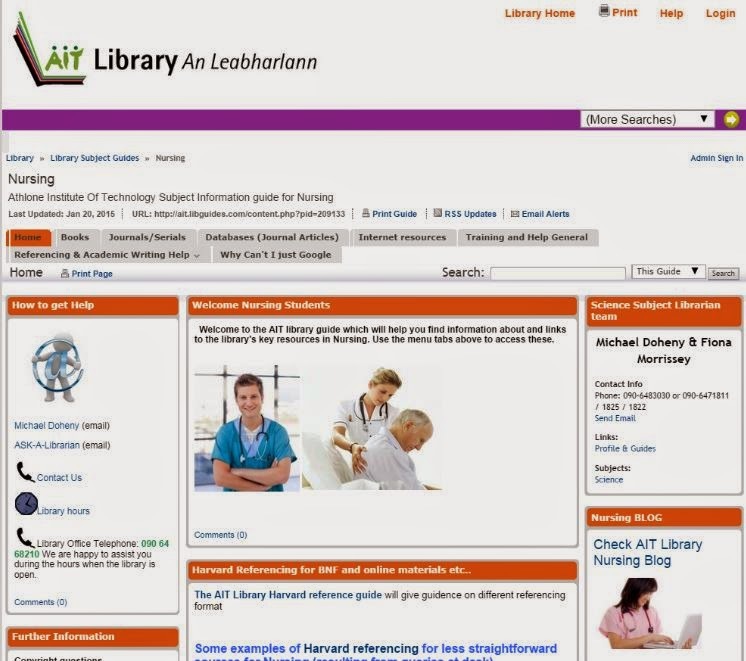 Other Universities employed a team approach, such as UCD which developed their LibGuides using a pilot team. The importance of collaboration among many different members of library staff to make LibGuides a success was also evident. For example, the important contribution provided by Digital and Technical colleagues was highlighted by Anne McMahon from UL. Josh Clark, UCD, emphasised the importance of ensuring that you are using the correct links for everything and involving your colleagues in the library to do so. Similarly, most universities engaged with Subject Librarians to develop subject specific guides. Interestingly Una O’Connor (AIT) pointed out that the Subject Librarians in AIT are responsible for their own creative content but that initially the staff were keen to have a template of sorts to follow when getting started. Ric Paul from the University of Southampton Library also provided a fascinating presentation about using LibGuides to replace their Library Website. This presentation demonstrated the immense possibilities afforded by LibGuides, particularly version 2. Some institutions, such as UCD and University of Southampton are currently using the upgraded version of LibGuides, version 2, while other speakers are planning to upgrade. Anne McMahon (UL) provided an excellent overview of the UL experience of migrating to version 2, which was quite positive with good support provided by the company, Springshare. Version 2 seems to provide enhanced functionality, such as enhanced mobile appearance and greater flexibility when adding content. Another perspective is provided in the JMLA by Coombs (2015). • LibGuide users, by and large, operate as a community of practitioners who willingly share their content. Sharing, customisation and re-use of content. E.G. Maynooth University developed their Bibliometrics guide with the help of Michael Ladisch from UCD. While the UCD Data Management LibGuide was developed by reusing content from the University of Queensland and elsewhere with acknowledgement. • The vendor, Springshare, provides good online support with speedy response to queries. • The guides are easy to update. • Significant customisation and enhancement is possible, if desired, by using Java script and cascading style sheets (CSS) coding. • Useful features of version 2 such as the Asset Manager, which makes sharing and reuse of content such as PDFs, images etc. easier. • Ease of obtaining usage statistics, which can be enhanced with Google Analytics. • Professional and aesthetically pleasing appearance LibGuides provide. • Ease of integrating other SpringShare and non Springshare products into LibGuides. For example, UCD integrate an RSS feed with UCD Library News, UCD Library Twitter Feed and LibCal (another Springshare product to showcase training activities). LibSurvey is another product that was also mentioned. • James Molloy, UCD emphasised the scope to partner with Academics to embed relevant content for users and the ease of editing LibGuides enhances this. • There is an annual fee for LibGuides and the fee for version 2 is slightly higher than that of version 1. One must question the likely future costs associated with this product and whether Libraries may feel, having migrated the majority of their Web content onto the platform, that they may have to continue using it even if it no longer serves their purposes in the future or indeed pay more for an improved system. A couple of speakers raised the issue as to the longevity of LibGuides, which raises the question as to whether it is a sustainable long term platform or a current fad? • There seems to have been a significant wait time for the release of version 2. • Longer term users of LibGuides, such as Una O’Connor (AIT), expressed a strong desire to migrate to version 2 to explore new possibilities and perhaps being strongly aware of the limitations of version 1. • Java Script/CSS coding skills are required to make significant customisations and enhancements. Coding skills offer huge potential to transform the content. While many of the current users felt that coding skills were a desirable skillset for a member of staff to have, others also questioned the benefits of a package which is “easy to use” if coding is essentially required to create an enhanced look and feel. • Claire Fox, DkIT, questioned how interactive LibGuides really are, even with the possibility of including surveys/quizzes. It may be a challenge for Libraries to glean meaningful feedback if students aren’t encouraged to communicate with us via LibGuides. • The impact of LibGuides was also queried. One pertinent issue is trying to determine if the usage is primarily by people outside of the institution and possibly even other Libraries assessing other offerings from across the globe. It was also noted that if LibGuides are used in hands-on IL sessions this will immediately cause a spike in usage, but may not be indicative of value or benefit afforded to students. The training day was very useful and provided a good introduction to LibGuides for a novice like myself. As aforementioned the afternoon session was divided into two tracks, so I would be very interested to hear the thoughts of more experienced users who attended the other session. My take home messages from the event are: there is a wealth of knowledge amongst colleagues about LibGuides and that many institutions both in Ireland and abroad are happy to provide permission to share content. LibGuides afford Librarians immense possibilities to shape and customise their web offerings while providing a user friendly interface and scope to embed lots of different kinds of content. The annual costs associated with the product are a serious consideration however. Similarly, if this is something that is invested in we need to develop very meaningful feedback loops to ensure value for money and an excellent user experience. Thanks to all of the speakers and other attendees who shared their experiences and expertise so freely, links to their LibGuides are below. Thanks also to ANLTC and UCD for organising and hosting the event. Coombs, B. (2015), 'LibGuides 2', Journal Of The Medical Library Association, 103(1), 64-65.